Felicitations and honour by the Punjab Chief Minister at a state level function on Fateh Divas at Fatehgarh Sahib came as a salutation to the spiritually enlightened vision and literary prominence of legendary litterateur Harnam Singh Shan. He was presented a citation, shawl, memento, ceremonial sword, siropa and a cash award of Rs 51,000. 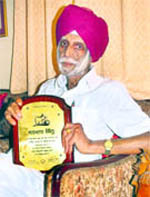 A genius with intuitive wisdom and vast knowledge, Professor Emeritus, Dr Harnam Singh Shan (87), ever sporting an innocent smile, is a renowned scholar of religious and Punjabi literary studies. "All his works on history of religion, folklore and secular literature are more of dedication rather than occupation,"Prof John Burton Page of London University had once opined. His scholarly work deals with a variety of fields, such as language, literature, culture, religion, history, tradition, philosophy, lexicography, Sufi and Sikh folklore. He holds the highest academic degrees, including Ph D in Indian Literature from University of London and D.Litt. from PU besides eleven other national and International degrees. Shan, at the ripe age of 87, is credited with 87 publications, 234 research papers, 67 book reviews and much more. With eleven national and international awards, having held 110 positions in literary organisations, participation in 200 conferences in India and abroad, the highly decorated author is neither tired nor complacent as six of his prestigious works are in print or awaiting release. 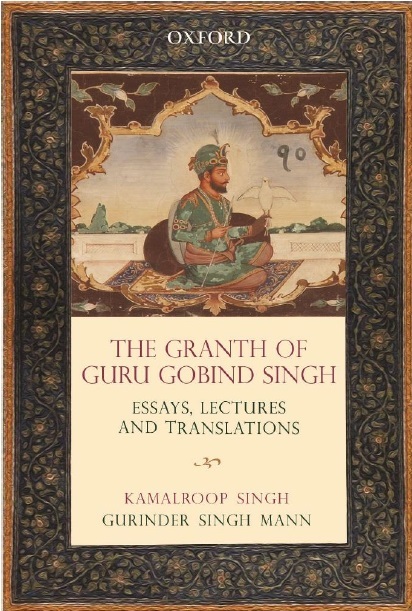 Most prominent of them all is Guru Granth Sahib- An Analytical and Comprehensive Dictionary of the Thought of the Sacred Sikh Scripture running into 1428 pages (for Punjabi University Patiala), which is the apex of his genius.